Our facilities can cater for a large number of varied activities. Our hirers include local organisations, charities, sports teams and schools. Whatever the event, we have the facility for you. We have a pool, sports hall, 5-a-side football pitch, cricket nets, dance studio, kitchen, rehearsal spaces and meeting rooms. There is also a reception room and small café which is available for use/hire for events, and there is full disabled access so everyone is welcome. To request a tour of the building and our hire spaces, or to make a booking, please email us or call us on 0207 939 7400. 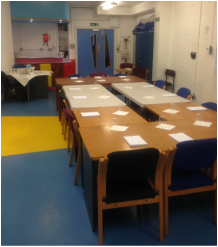 As one of our larger meeting rooms, this room has all manner of uses, such as rehearsal space, meeting room or space for training courses. This room comes complete with kitchenette, perfect for those wishing to provide their own refreshments. 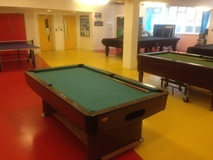 Used by the Youth Club as a Games Room, during the day the snooker and ping-pong tables can be moved and space made for meetings, training sessions or lectures. A large and airy space, this is available for all manner of activities. Many different sports clubs - from footballers and cheerleaders to martial arts - use it to train but it could also be used for large meetings, fairs or community events. Designed as a 5-a-side football pitch this can also be used for other sports such as netball, or even archery. This space also has cricket nets. With its wide open design, sprung floor, dance mirrors and ballet bars, this is a fantastic space for dance/ drama classes or as a rehearsal space. Our training kitchen consists of seven ovens and gas hobs, fridges and dishwashers. Perfect for cooking courses for all abilities. Welcome all swim clubs! Fully equipped with male and female changing and shower facilities, and full disabled access, our swimming pool ranges from 1-2m in depth. This is the ideal place for schools or swim clubs to come for their swimming lessons, galas, or even just for a fun outing, and perhaps even the occasional pool party. Please contact Tritons who now deal with all swimming pool enquiries.